A few weeks ago I made my Overnight Bloody Marys, an extravaganza to be sure. So many of the specialty products were pricey, but the pickled asparagus was the worst! It was close to six bucks for a six-ounce jar. When you take a few minutes to make your own, especially if you have a well-stocked spice cupboard, the cost for this Easy Refrigerator Pickled Asparagus (above the asparagus itself) is just pennies. I love the flavors of these Easy Refrigerator Pickled Asparagus. There are some of the standard pickling spices that are just dropped in each jar before they’re filled and topped off with brine. I chose these particular spices because they’re ones that are flavorful enough to stand up to the asparagus and come forward with just a short soak in the brine. I think they look pretty, too, in the jars and these make fantastic little gifts. Maybe a hostess gift? Just make sure the recipient knows that they’re to be kept in the fridge. If you’d like to try this with a standard pickling spice, you can use a store-bought one or mix up one of your own. 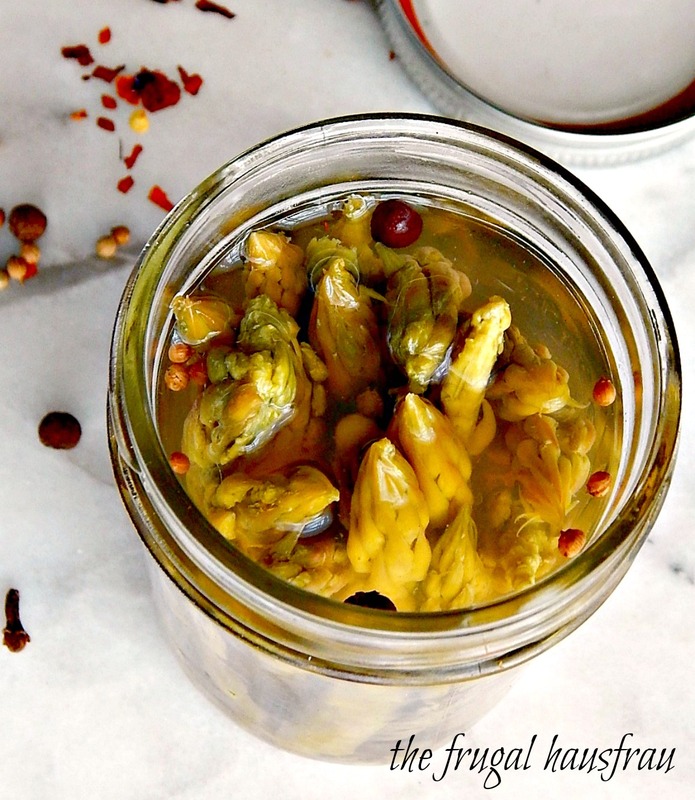 I have a Homemade Pickling Spice right on my site you can use as is or for inspiration. I’d use a little more than 1/4 teaspoon per jar, but try to get a little of all the spices in each jar. If you’re not familiar with refrigerator pickles, and the difference between “putting up” or canning pickles for storage, let me clear it up: A refrigerator pickle is made to keep in the refrigerator, and will keep well for several weeks with no problem due to the high amount of vinegar and the refrigeration. Vegetables made into pickles that are “canned” or “processed” and meant to be stored in the cupboard need more care. There will be an exact recipe to moderate the PH level, sterilized jars, and they need to be processed, usually in a hot water bath. Recipes are usually large so cooks can maximize their time and maybe even preserve a harvest. While refrigerator pickles are best if they have time to marinate in the liquid, at least an hour, and preferably a day or two, they just take a few minutes to make. Even if you’re thinking about a big canning project, a couple of jars of refrigerator pickles are a great way to “test” a recipe if you scale it down. Since refrigerator pickles are so easy and quick and can be made in small amounts, they can be whipped up any old-time. Think about refrigerator pickles if you have leftover vegetables as a way to “rework” them. Cauliflower, carrots, pearl onions, and green beans are great candidates for this strategy! These are “specialty” Asparagus pickles – I used the tops only and it made just about two small jars. The bottoms didn’t go to waste – they went into my Asparagus Frittata, but could also be added to a soup (combine with spring peas, maybe, in a cream soup), go into a stir-fry or some other recipe. See my 25 Ways to Use Leftover Asparagus for inspiration. Links are at the bottom of the page. Shop well for your asparagus. It’s never a cheap veggie. Asparagus is in season in the Spring, but may just be at a better price right before a holiday, especially the spring holidays, Easter, Mother’s Day and even Memorial Day. As a matter of fact, if you buy too much asparagus, these simple pickles will save it. Vinegar of all kinds are going to be at a low around Easter, even the specialty vinegar, and is often not advertised as a sale. Check for it and if you make your own salad dressings, stock up because you’ll want several different kinds of vinegar on hand. A super easy specialty Pickled Asparagus. Bring a pan large enough to hold the asparagus without bending, with several inches of water to a boil. Blanch asparagus and simmer to desired degree of tenderness. Immediately plunge into cold water to preserve color. Drain. Take a little care to keep the asparagus tips aligned and in one direction, so they’re easy to add to the jar, tips up. To each jar, add the spices, then the asparagus. In the meantime, in a small pan, bring a mixture of vinegar and water to a boil. Pour over the asparagus in the jar. Add lids and tighten, then turn upside down to distribute spices. Refrigerate after the jar is cool. If you’d like, add a bit of honey or sugar to the water/vinegar mixture. This entry was posted in Click here for Fabulous Food Posts and tagged Asparagus, Canning, Frugal Hausfrau, pickles, Vegetable Side. Bookmark the permalink. Interesting recipe. Thicker Asparagus can sometimes be quite stringy. Does the pickling help overcome that at all? Hi Donald, the pickling doesn’t do anything, really, to make them more tender and less stringy. On these particular pickles I used just the tops & just cooked to the desired tenderness. These really need to be crisp/tender, if that makes sense. Not hard, but not totally limp, either. I love homemade pickles like this because one can really play with the spices, notice no dill! But just a bit of heat. Asparagus absorb so many flavors and have such a great texture when pickled! I love pickled foods. However, I’ve never tried asparagus. Will definitely try making same. Thanks for sharing. What a beautiful jar. I love how it maintains the beautiful color and dresses up your crudite platter. Oh I love pickled asparagus, I really love pickling in the refrigerator. Looks wonderful. Thanks, Suzanne! I have asparagus on the counter right now I was going to oven roast, but since I posted this (my jar is long gone, made a couple weeks ago) I can’t get these pickles off my mind! Love pickled asparagus with egg salad. Great easy recipe for summer. Check out all of Frugal Hausfrau creations on her blog.